The category 4 hurricane caused extensive damage to forest and timber lands across Florida’s panhandle. Official White House photo by Shealah Craighead. John Alter and Elizabeth Alter manage more than 1,000 acres in Malone, Florida, including 18 Tree Farm stands. The Alters were honored as Florida’s Outstanding Tree Farmers of the Year in 2015. 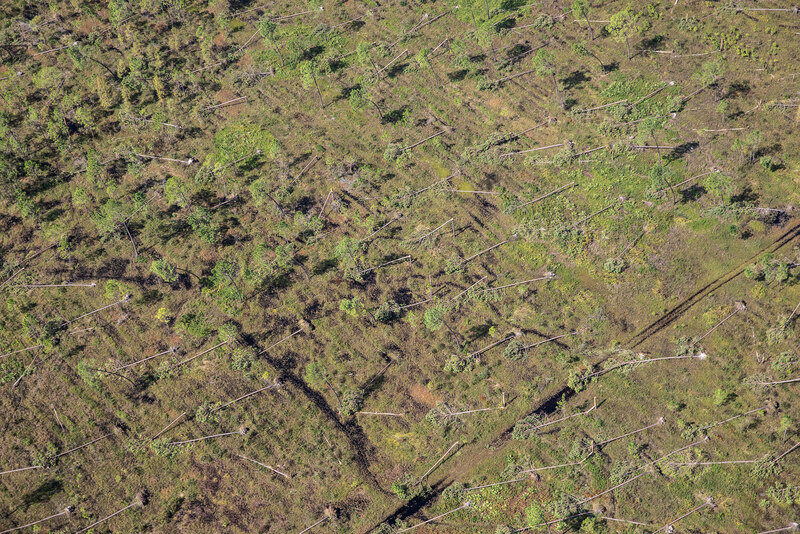 The monetary estimate of timber damage in Florida alone is well over $1 billion. Georgia is reporting estimates of more than $370 million in damage, along with $20 million of timber losses in Alabama. Research shows that damage from individual storms and other forest threats, such as insects, fire, and disease, can create widespread wealth redistribution among timber landowners. The entire supply chain is impacted – from landowners to loggers to mills and beyond. Studies by research forester Thomas Holmes and project leader Jeff Prestemon show that growers with damaged stands lose wealth. Timber growers with damaged stands and timber consumers – mills – tend to lose out, he explained. However, timber producers with undamaged stands benefit because wood is still needed, and prices can rise to make up for the lack of high-quality wood available after salvage operations. 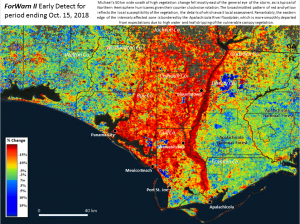 Holmes predicts that, based on a timber market welfare analysis, the aggregate losses to timber producers and consumers in Florida from Hurricane Michael may exceed the current $1 billion estimate. 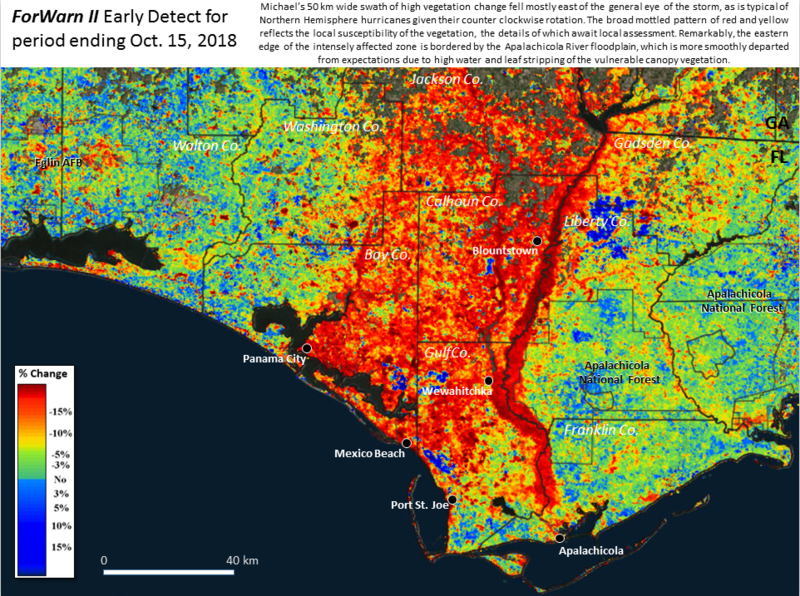 The ForWarn II tool, which SRS scientists helped develop, uses satellite imagery to reveal disturbance impacts before people can view damage on the ground. In the past, state governments have taken steps to assist timber managers with salvage operations. Assistance takes the forms of relaxing weight limits on roads, allowing logging trucks to carry heavier loads, permitting larger than normal log storage volumes at mills, and assisting private landowners and nongovernmental organizations with salvage planning. 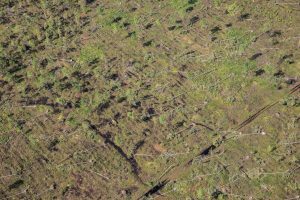 “It would take 2.4 million logging trucks to remove all of the dead trees that we have in Florida as a result of this hurricane,” says Jim Karels, state forester and director of the Florida Forest Service. The Forest Service supports restoration efforts by working closely with state foresters in Florida and Georgia to increase timber sale and salvage operations. At the states’ request, agency specialists will also provide technical assistance to help private landowners write plans for treatments and get their timber to market. The Forest Service also provides funding to state forestry agencies to administer landowner reforestation programs. For more information, email Patty Matteson at phmatteson@fs.fed.us.